Laying the groundwork. Developing the framework. Building the foundation. 2016 was a building year for this little company that could. 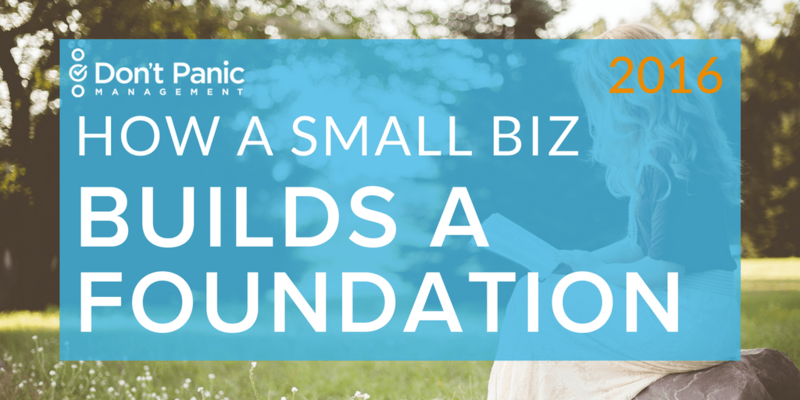 True, we may not build houses or plant gardens, but we do help other businesses grow, and this year we realized it was time to take a dose of our own medicine. It was time to start treating Don’t Panic like a client. The goal was to put a strong foundation in place so that every decision didn’t have to begin and end with me. I wanted to give more responsibility to my team members through a mutually agreed-upon set of values and goals. That way they could work together on business growth as I get increasingly busy with speaking, writing, and traveling to get the word out about the work we do. But building a foundation does not come without sacrifices—we decided to limit onboarding new clients for a quarter so we could focus on the plan to restructure. You can’t continuously be working on the business if you’re always working in it, as my friend Chris Ducker says. And you have to spend money to make money. Running an entirely virtual team has its perks (who doesn’t love to work from home in yoga pants? ), but it also can be challenging to get everyone on the same page. We chose to invest in a long weekend in-person retreat this year because we knew there were so many ideas floating around for the future of this company that deserved our collective attention. Through a series of meetings, presentations, walks, and fun activities, we were able to develop personas for our ideal client and virtual assistant, determine a plan for our re-branding, identify other streams of revenue that we could take advantage of, and solidify a marketing plan for the year to come. Although I can’t say everything has gone exactly as planned (does it ever?? ), the valuable time we spent together helped inform our strategy for most of 2016. To Don’t Panic or not to Don’t Panic, that is the question. Indeed. We took a hard look at our brand name, voice, and design to determine whether it reflected really our core values. While this conversation could have lasted months, we put a pin in it when, after many hours of brainstorming and research, we found that we were truly in a unique position with a brand name and reputation that suited our offerings. The design, however, needed some work. We enlisted the help of Neil Wengerd (who we found through Crew.co) and Scott Ellis (who came recommended by Rainmaker) to develop an entirely new look and feel for Don’t Panic. After many, many agonizing hours over color tints, font shapes, and word choices, we landed on a fantastic new logo and web design that we could not be more proud to call our own. I recommend both Neil and Scott highly if you’re looking for a new brand or website. I would be remiss if I didn’t mention the personal building that many of our team members took part in… they built babies! That’s a pretty big deal! We’ve had several Don’t Panic babies born over the years, but this year was the first time that a full-time employee had one. Because our team is our lifeline, we wanted to somehow provide a way to support our mothers and fathers in a way that would be helpful and fair to them. Enter Don’t Panic’s first iteration of a parental leave policy! You can learn more about our first employee experience with it and all the fun, flexible details here: Create a Parental Leave Policy Moms and Dads Can Actually Use. There’s no time like the present for making changes in business and in life. And as painful as they might be (change is hard! ), the groundwork we’ve laid this year has set us up for a year of propulsion and I couldn’t be more excited or proud of what we’ve built. I’d love for you to take a look and share our 2016 infographic about all the amazing professional and personal milestones we’ve hit this year. When I first looked at our year all in one place, I teared up a bit. It was a difficult one for a lot of reasons, but I’m proud to call these men and women friends, colleagues, and fellow DPMers.